OnLive has already given Microsoft loving iPad owners a hefty, gratis helping of Windows 7, but that doesn't mean they haven't been building a paywall. What's behind the freshly dried brick and mortar? OnLive Desktop Plus, an optional, subscription based upgrade that touts new features for users who are willing to pay a fee. Five dollars a month buys you a cloud-accelerated web browser (that would be Internet Explorer 9, complete with fully functioning Adobe Flash and Acrobat plug-ins) and priority access to the OnLive Desktop service -- freeloading "standard" subscribers can only access the service on an as-available basis. OnLive says that the cloud powered browser's full Windows experience finally gives the iPad full Flash compatibility, giving you the chance to feed your nostalgic need to watch cartoons check their email. We got an early look at the app, read on for a quick hands-on and OnLive's official press release. OnLive Desktop Plus isn't too different from the free "standard" edition the outfit launched last month, albeit with an important distinction: internet access. Until now, users of the service had to be satisfied with content they uploaded to their OnLive account and what they could create using the desktop's somewhat limited suite of applications. OnLive Desktop Plus, however, gives you access to almost anything the internet can offer -- as long as you don't need to download it. OnLive made it clear to us when we spoke last that the cloud Desktop would only run approved programs, and sure enough, downloaded executables wouldn't run, let alone install. While this was expected, we were a little disappointed to find that additional plug-ins, such as Microsoft Silverlight or Java updates, are blocked as well. You'll still need to get your Netflix fix on the iPad's native app. Still, the countless other web experiences we encountered worked almost flawlessly, sped along by OnLive's absurdly fast gigabit connection. Our cloud-enhanced browser pulled over 650Mbps down in a standard speed test, and clocked over 120Mbps on uploads. Most resource heavy webpages, flash-based web-apps and flash and HTML5 videos load almost instantaneously. 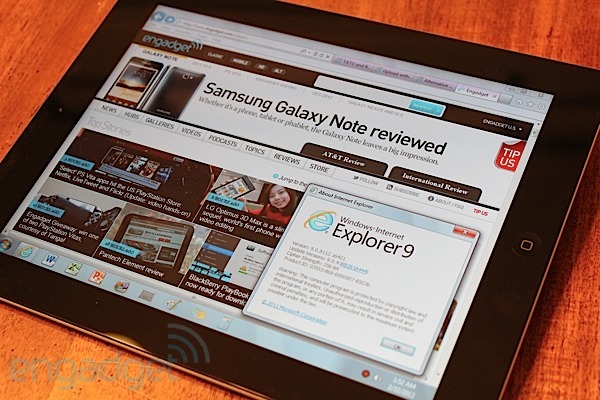 Browsing pages is a comfortable experience, too, seamlessly adopting the common swipe and pinch gestures one expects from tablet navigation. It works well in most cases, though a few odd webpages wouldn't allow us to zoom. Flicking and scrolling is fairly smooth, but we did find it to be a tad more jittery here than the slate's native browser -- though not enough to bother. 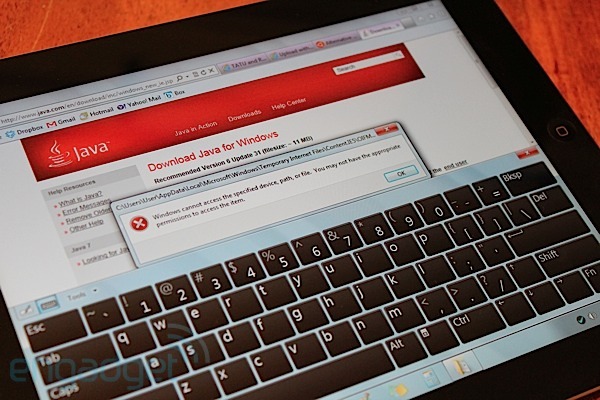 Desktop plus users will still find themselves struggling with Windows 7's native keyboard, vainly wishing they could just pull up the iPad's own on screen offering for simple tasks. OnLive told us that Microsoft's touchscreen typewriter was kept to ensure full Windows 7 compatibility, but recognizes that it's not the ideal keyboard for the iPad. The app's virtual keys, we're told, are still evolving -- the outfit recommends using a Bluetooth keyboard whenever possible. We couldn't agree more. OnLive Desktop Plus' internet access does a decent job of living up to the app's "no-compromise, media-rich" promises, but falls just short of perfection. The inability to install additional browser plug-ins like Silverlight constitutes a compromise, keeping pages reliant on those technologies slightly out of reach. Fan's of other major browsers will have to settle for Microsoft's standard offering as well, as the app's ban on executables makes installing Chrome or Firefox impossible -- though it should be noted that application customization will be available in the upcoming OnLive Desktop Pro. Regardless of these nicks, Plus does manage to offer a very full, functional and extremely fast desktop browsing experience to Apple's slate, and represents an elegant evolution to OnLive's budding desktop service. Palo Alto, CA – February 22, 2012 – OnLive, Inc., the pioneer of instant-action cloud computing, is pleased to announce the OnLive™ Desktop Plus service, bringing gigabit-speed¹ accelerated browsing with full Adobe® Flash® to devices with the OnLive Desktop App, regardless of the device's local Internet speed and local computing capability, making OnLive Desktop Plus by far the world's fastest mobile browsing experience, if not the fastest consumer browsing experience available on any device. The free OnLive Desktop App, currently available on iPad®-and coming soon to Android®, PC, Mac®, TVs and monitors-delivers no-compromise, media-rich, instant-response Windows® applications including Microsoft® Word, Excel® and PowerPoint® software, and as of today, Adobe® Reader® for PDFs, along with 2GB of cloud storage. OnLive Desktop Plus, available for $4.99/month at www.desktop.onlive.com, provides all OnLive Desktop Standard features plus OnLive's gigabit-speed accelerated browsing experience with full Flash player capability. With OnLive Desktop Plus, the iPad not only becomes 100% Flash compatible, it becomes the world's fastest mobile Flash player. Running remotely on powerful PCs in the cloud that are connected by Gigabit Ethernet to the Internet, OnLive Desktop Plus utilizes OnLive's patented instant-action cloud gaming technology to deliver a seamless PC application and Web experience, instantly responsive to multi-touch gestures, as well as a full PC on-screen keyboard, handwriting recognition and optional Bluetooth® keyboard. Regardless of your local connection speed, be it Wi-Fi or 4G LTE, even the most complex Flash websites-including ones that would take minutes to load over your local connection-load in seconds, instantly delivering fully interactive animation, video and sound. A 50 megabyte file from cloud storage (e.g., Dropbox) or a 15 megabyte attachment from Web email (e.g., Gmail™, Yahoo!® Mail, etc.) can literally download or upload in less than a second, resulting in an utterly transformative Web experience. And, despite the astounding speed improvement, OnLive Desktop Plus can dramatically reduce Web browsing data usage, since only the top layer of the currently visible part of a website is ever sent over the local connection. Essentially, OnLive Desktop delivers only what you can see or hear at a given moment, potentially reducing data usage by a factor of 10 or more. "Experiencing a full Flash-enabled Web experience at gigabit speeds on iPad is nothing short of breathtaking, and OnLive Desktop Plus is your ticket to ride," said Steve Perlman, OnLive Founder and CEO. "Combine that with OnLive Desktop's full-featured Microsoft Office and Adobe Reader PC applications and not only do you have the world's fastest mobile browser, but the world's most powerful productivity tools literally at your fingertips." The free OnLive Desktop app is available for iPad now in the United States. Android, smartphone, PC, Mac and monitor/TV support (via the OnLive MicroConsole™ thin client with Bluetooth keyboard/mouse) are coming soon-with your same OnLive Desktop available by login from any device-as well as support for the United Kingdom and other countries.